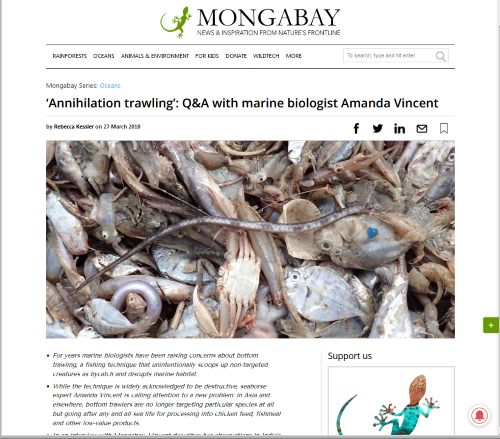 March 27, 2018 — Dr. Amanda Vincent explained the dire situation with what she refers to as "annihilation fishing" happening in parts of Asia and beyond in an interview with the conservation news site Mongabay. ICFC helped to enable Amanda and her colleague Tanvi Vaidyanathan to travel last fall to India, where the problem is severe, in order to provide input to managers and policy makers. This was a crucial opportunity because India’a National Policy on Marine Fisheries was released in April 2017 and implementing rules and regulations are being developed now. This trip went very well as we report on our project webpage. Bottom trawling is also a severe problem in Southeast Asia and our project in Cambodia is making a difference there.